As the halfway point of the 2018 regular season disappears into the rear view mirror, the Heisman race is heating up. The 2017 season saw an Oklahoma quarterback win the program’s sixth Heisman trophy and this season has a chance to see the seventh. Kyler Murray is putting up impressive numbers while displaying high accuracy, poise, and athleticism. Quarterbacks are certainly no stranger to the award; since the turn of the century, 15 of the 18 Heisman winners have been quarterbacks. This season is already morphing into a four quarterback race. Murray, Ohio State’s Dwayne Haskins, Alabama’s Tua Tagovailoa, and West Virginia’s Will Grier are leading everyone’s Heisman poll. The Big Ten and the SEC have not been known for high-stat quarterbacks in recent years, but both Haskins and Tagovailoa are bucking that trend and setting their teams on a path to the playoff. In the Big 12, Grier and Murray are showing off their skill and the weapons they have at their disposal. All four are excelling in different ways. The table below compares them through six games (although Haskins and Tagovailoa have played seven each, only six game’s worth of data is shown). Murray’s legs are allowing him to make plays that the others aren’t, resulting in him leading the group in rushing stats and all-purpose yards and being tied for the most total touchdowns. Additionally, his passer rating of 227.8 is incredible (more on that below). 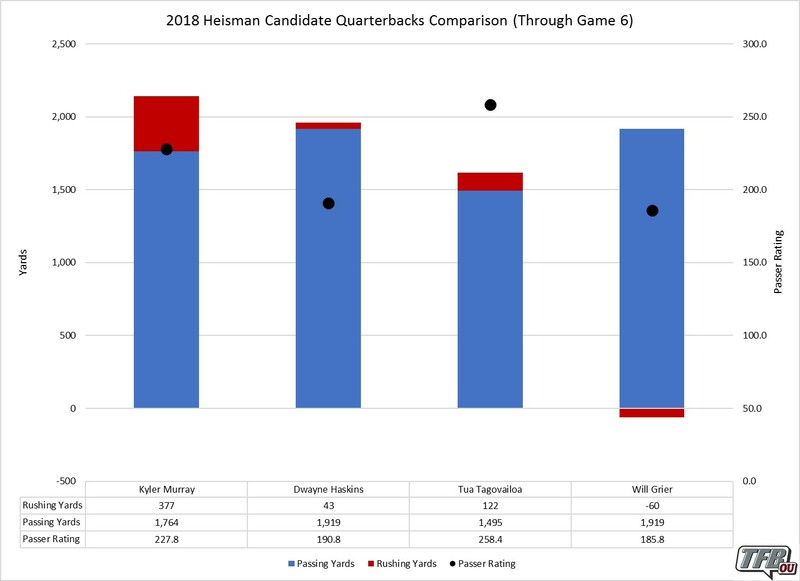 Haskins is thriving on relatively short distance throws and is putting up a lot of yards through a high number of attempts. Despite the fact that Murray’s yards per catch, yards per attempt, and passer rating are all off the charts, Tagovailoa is leading in all three areas. His command of the offense has been eye-popping as Alabama puts together its most efficient offense in years. Grier’s stats look eerily similar to Haskins; large volumes on relatively shorter passes. They are all excelling in different areas now; however, each player has tough games ahead before voting takes place. A few more months of football will leave only one able to take home the Heisman. Murray had a lot of expectations coming into this season. A former five star recruit, he was on college football’s radar early in life. Then, he transferred from Texas A&M to Oklahoma. Two years later, he was drafted number nine in the MLB draft and signed a contract north of four million dollars. To top all that off, he is the starting quarterback at a school that just saw the most efficient college football passer of all time get drafted number one in the NFL Draft. It’s fair to say that Murray had a lot of eyes on him before the season even started. 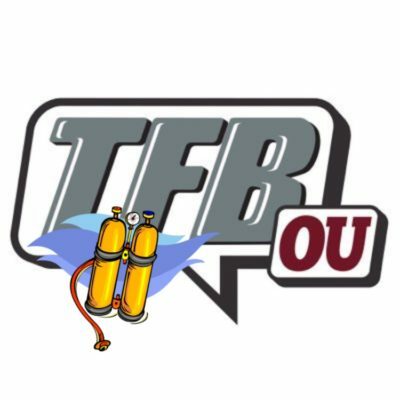 No rational OU fan expected Murray to be Baker Mayfield. However, Kyler’s numbers and play are speaking volumes about how smoothly the transition from Mayfield to Murray went. His passer rating of 348.0 against Baylor was higher than any single game that Baker Mayfield ever had. He’s running the ball with more success and making plays all over the field. Overall, he’s been even better than Oklahoma fans could have hoped for. The Sooners have had some excellent quarterbacks in the past 20 years; Kyler Murray gives up nothing to them. Despite having the fewest completions and attempts of any quarterback on the list (by a lot), he is second in passing touchdowns. His yards per catch and yards per attempt numbers are eye-popping. Mayfield broke the record for passing yards per attempt in 2017; Murray is crushing it. His passer rating is even higher than Mayfield’s was, and Baker broke that record as well. Kyler’s speed gives him the ability to be a true dual threat quarterback, which none of the others can claim. All of that results in Murray leading in total yards and total touchdowns. 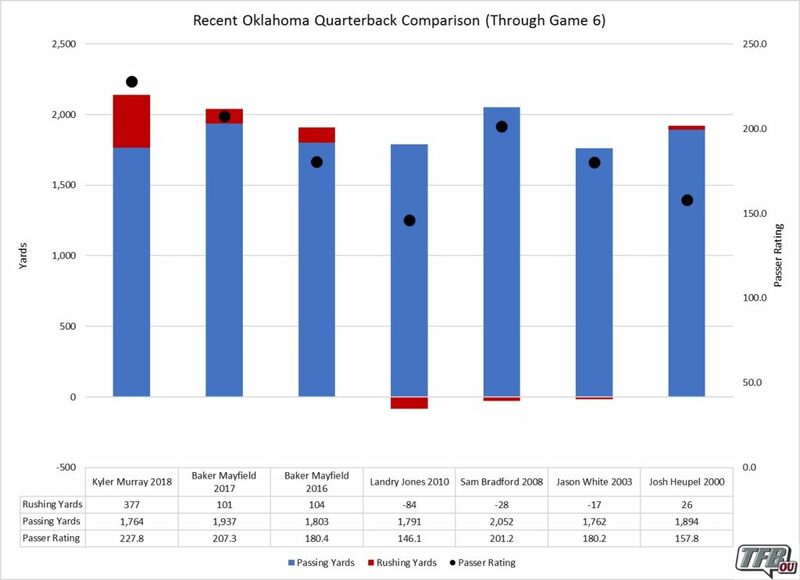 Not only does Murray compare favorably to previous OU quarterbacks, but he stacks up nicely against previous Heisman Winners. To have higher yards per catch, yards per attempt, and passer rating than the previous 12 Heisman-winning quarterbacks did through half of the regular season is incredible. Murray’s yards are above the average and his passing touchdowns are the third most, despite having the second fewest number of passes and completions. Kyler comes in fourth for all-pupose yards and second for total touchdowns. All in all, he’s comparing very favorably to some of the most prolific quarterbacks to ever play college football. Enjoy the ride OU fans; Kyler Murray is pretty good.